Streams in the Desert LIVE! Elaine Live & Lauren too! Start your own show today! Do you want to shift your habits to achieve your goals … quickly and with enjoyment? Then listen this week to Sara Bazan. Sara Bazan, MA, MFT, has 12 years of experience helping people achieve their personal and professional goals. She is a Certified Life and Executive Coach, a Licensed Psycho-therapist and an NLP Practitioner. Sara facilitates the shifts in habits and mindsets necessary to achieve ultimate success in all areas of life. Sara creates individualized success programs to improve the health and wealth of her clients. Clients experience increased energy, vitality, clarity and focus that creates the momentum they need to take it to the top! Ep. 274 Walt Interviews Ivanka From Tidy Moose – Is Clutter Holding You Back? Ep. 265 Walt Interviews Amber De La Garza – STOP Screwing Your Productivity! Ep. 261 Walt with Sammy Pratt – Round 2 of Who’s In The Hot Seat Now? Ep. 257 Walt with Sammy Pratt – Who’s In The Hot Seat Now? Ep. 252 Walt Interviews Giovanna Dottore – What Do You Want To Be When You Grow Up? Ep. 249 Walt Grassl interviews Greg Parton – An Actor’s Journey. Ep. 248 Walt Grassl interviews Ruth Anne Caukwell – Finding Your Confidence, Again. Ep. 237 Walt Grassl and Ed Vanderlee – Interviewing, Ice-breakers, and I … ? Ep. 225 Walt interviews Corinne Enslin – I Want To Speak, Now What? Ep. 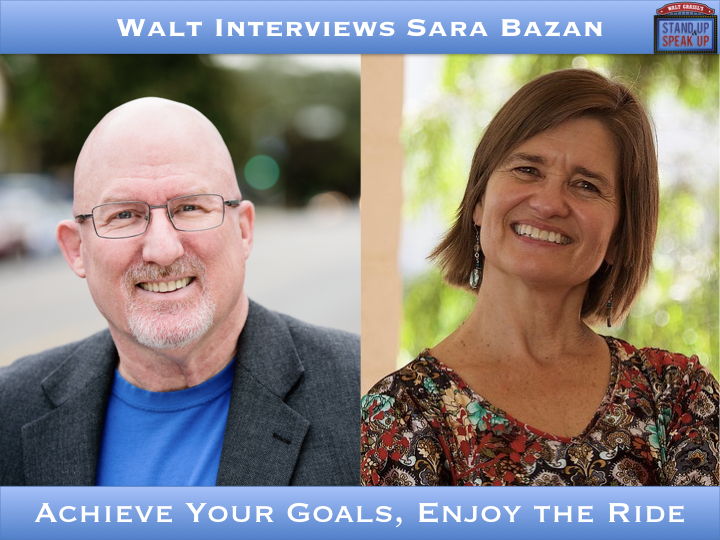 223 Walt interviews Susan Sheppard – What Difference Do You Make? Ep. 203 Walt interviews Lamar Johnson – Dare to be Different! Ep. 199 At 11a PT • Walt interviews David Goad – Communicate to Connect. Ep. 198 Walt shares things he’s learned from learning and memory expert Jim Kwik. Ep. 197 Walt interviews Mary Cheyne – Tell Your Inner Critic to SHUT UP! And the Real You to SPEAK UP! Ep. 124 Sandra Wilson on the major keys to success and happiness. Ep. 59 Darren Held talks about benefits of improv. Ep. 58 Ino Enwek talks about speaking comedy and dishes dirt on the host. Ep. 56 Martin Presse on Confidence. Ep. 54 Larry Broughton talks Stage Fright. Ep. 53 Craig Duswalt talks about performance anxiety. Ep. 52 Carol McManus shares tips on how to be a better public speaker. Ep. 51 Rich Hopkins shares his amazing speaking journey. Ep. 50 Sonnjea Blackwell talks about improv for life. © 2019 Star Worldwide Networks. All rights reserved.